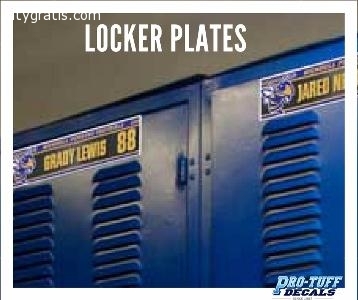 Pro-Tuff Decals provides full color personalized with each player's name and number in your school colors and design. 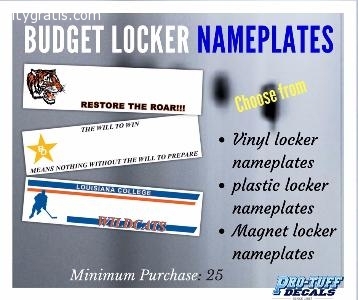 Also available cut-to-shape and with metalized option! 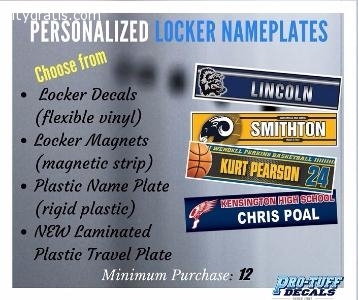 These personalized locker nameplates are available in 4 types: Locker Decals (flexible vinyl), Locker Magnets (magnetic strip), Plastic Name Plate (rigid plastic), NEW Laminated Plastic Travel Plate (made especially for stacking and reusing). For full price chart visit our site now!